This article is about Do-It-Yourself dedicated centralised fileserver. This article discuss about the Operating System and hardware related to this built in general. The NAS storage capacity demonstrated in this article is limited to 15 Terra Bytes expandable (by stages) with 5 Hard Drives 3TB each limited to the selected hardware and budget. A reasonable scale for SOHO and small studio environment. This article is for non technical people. Limitation of this article: Does not discussed in details of the selected OS features and configurations of the selected platform. The arrangement of this article is as follows: Introduction to NAS and NAS OS, brief discussion about the network (part 2), the setup and systems, stages of storage expansion, cost breakdown (part 2), photos, some advise and opinions. 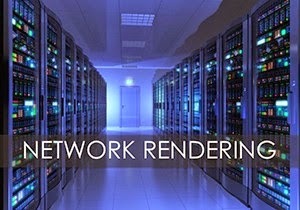 This article is the continuation of Introduction to Distributed Network Rendering part 1 (DNR). This article discuss about the software and hardware related to DNR or VrayDR in general. The DNR scope demonstrated in this article is limited to 2 to 3 units but able to expand to maximum of 10 units of computer based on the network license policy implemented by the software creator. A reasonable scale for SOHO and small studio environment. This article specifically refers to Vray for Sketchup application rendering scheme under Windows environment. The arrangement of this article is as follows: Introduction to the application and rendering engines, discuss about the network policy, the setup and systems, functions of each system, cost breakdown, photos, some advise and opinions. This note explains what is "Distributed Network Rendering" in general, and how it works in Vray for Sketchup. Other 3D applications may not have the same methodology and approach but i believe they would be able to achieve the same result and speed maybe varies. It took me 2 years to planned, research and deploy this not just on Vray, but on various 3D applications and their implementation as well. However, for best result and easy to execute is Vray for sketchup. This plugin is very polished and considerably cheap compared to other rendering engines. The meaning of cheap here covers the time to learn the application and to deploy the DNR functionality features as we all know that time is money. Copyright © 2013 vicvoon.blogspot.com All Rights Reserved. More than 20 years of experience in computer training and support. vicvoon's BLOG is an extension of learning experience created by vicvoon.com. Here you will find additional knowledge that I like to share with you from time to time apart from the course you took. Depending on your needs and requirement that you may find some of the topics in this blog interesting and might be useful to you as additional knowledge or career advancement. Additional Notes and Tutorials are available in the VAULT area. © 2014 vicvoon.com. Powered by Blogger.